Sometimes it makes sense to step away from the big picture and focus specifically on the individual components of a wellness program that can create a healthier workforce and save an employer money down the line. A biometric screening event is one part of a wellness program that can make a big difference right off the bat. Although some employees might be hesitant to let a technician draw blood at the office, today’s methods are simple, painless, and offer immediate results for the individual. How can you launch a successful biometric screening at the office? It’s easy! 1. Communicate, communicate, communicate! Use communications and branding to drive participation and understanding. It’s important to get the message across early and keep employees informed about their options. The more accessible and inviting the outreach materials are, the more willing employees will be when it comes to taking part in the screening process. 2. Take advantage of the teachable moment. 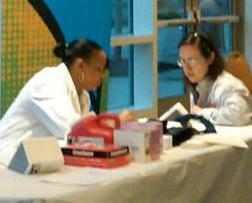 Biometric screenings are a fantastic way for employees to get an immediate snapshot of their overall health. The new fingerstick technology offers participants a virtually pain-free experience and results are available in 5-7 minutes. As soon as data are displayed, the screening technicians or a qualified health educator can explain the findings clearly and compassionately. Participants genuinely appreciate the one-on-one discussion of their results in the moment, and studies show that this immediate feedback (rather than mailed results) is the most effective way to instigate true behavior change. 3. Provide follow up support. Screeners and health coaches should be able to interpret the results at face value, but also break down the meaning behind the numbers for the individual in the broader context of a company health plan. It is particularly valuable if onsite technicians can outline any next steps and direct participants to additional resources. 4. Ensure reliable and protected data. Hiccups in data collection can lead to headaches in the HR department and sour the entire screening experience for the client. Clear, consistent guidelines for the screening staff followed by a thorough screener training can minimize the chances of a mistake being made. The accuracy of screening results is always a priority but compliance with HIPAA is absolutely essential. Minor slip-ups are unacceptable when it comes to the privacy of health information. Reach out to us at Wellness Corporate Solutions for more information about setting up a biometric screening for your company. Our personable and highly experienced screening team can provide baseline aggregate data to help illustrate the current health status of the workforce. There are many factors that come into play when implementing a wellness program but a well-run biometric screening is a critical part of the experience. These tips were recommended by California-based communications firm, Benz Communications.